THE award giving ceremony of the 3rd International Film Festival Bangladesh was held at Shaheed Zia Auditorium, National Museum on March 11. Ahlaam, a joint collaboration of Australia, Germany and UAE, won the International Jury Board Award. Directed by Mohamed Al-Daradji, the film received US $5000. An Indian Bangla film, Nihshabdo, by filmmaker Jahar Kanungo and Saratan, a Kyrgyzstan-Germany joint venture by director Ernest Abdyjaparov jointly won the 2nd prize of US $3000. The 3rd prize of US $2000 went to the Bride of Silence, a Vietnam, Germany and Australia joint production by filmmakers Minh Phuong Doan and Thanh Nghia Doan. The awards were sponsored by Standard Chartered Bank. The event was presided over by Enam Ahmed Chudhury, chairperson of the Festival Committee. 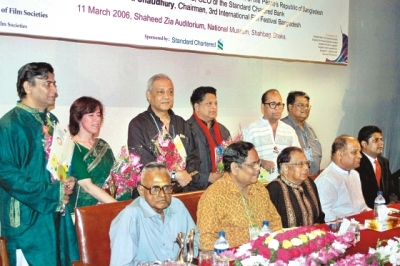 Among others, H Mofazzal Karim, chairperson of the International Jury Board, Harun Ur Rashid, chairperson of the Jury Board formed by Bangladesh Film Directors Association, Azad Rahman, President of Bangladesh Federation of Film Societies and Golam Rabbany Biplob, festival director spoke on the occasion. Tareq Masud and Catherine Masud's latest film Ontorjatra received the Best Film Award given by Bangladesh Film Directors Association. In the 'Bangla Showcase' category, Belal Ahmed's film Nondito Norok-e and Shasti directed by Chashi Nazrul Islam received the 1st and 2nd prizes respectively. Fourteen Bangladeshi films screened in the '50 years of Bangladeshi Films' category were honoured. The films are: Mukh O Mukhosh, Shutorang, Roopban, Bindu Thekey Britto, Megher Onek Rong, Jibon Thekey Neya, Titash Ekti Nodir Naam, Ora Egaro Jon, Shurjodeeghal Bari, Chitra Nodir Parey, Dhirey Bohey Meghna, Agami, Jadur Banshi and Matir Moina. Ahlaam, winner of the Best Film Award in the International Competition category, takes place in war-torn Baghdad in 2003. Amidst, pandemonium, uncertainty and death, the story zooms in on three Iraqi characters living in the ruins of a psychiatric asylum. These people are among many whose lives have been deeply affected by the American 'Shock and Awe' bombing campaign. Ahlaam is a bewildered young woman confined to the asylum after witnessing the violent arrest of her fiancé on their wedding day. Her dreams and seemingly impossible hopes are all she has. Dr Mehdi, working at the asylum, longs for a free country, where humanity is cherished not brutualised by hatred and fear. Ali, a former soldier and patient was once an optimistic man. He is a shell-shocked shadow now, traumatised by the American bombings of his platoon. The film brilliantly portrays the agony and aspiration of a nation yearning for freedom through these three characters.